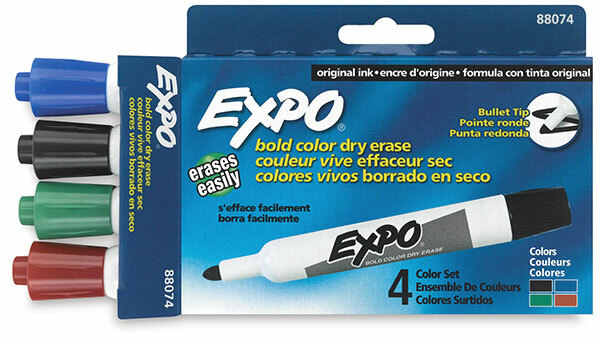 Expo Dry Erase Markers help you make your point in brilliant fashion, with bold intense colors that stand out, even from across the room. They’re available individually and in economical packs. For markerboards, glass, painted metal, etc. Wipes off easily with a cloth or felt eraser. Permanent on some surfaces. Available in Ultra Fine, Fine, Bullet, and Chisel Tip. Assorted Bullet Tip, Set of 4 — This set includes 4 bullet tip dry erase markers in Black, Blue, Green, and Red. Assorted Fine Tip, Set of 4 — This set includes 4 fine tip dry erase markers in Black, Blue, Green, and Red. Assorted Ultra-Fine Tip, Starter Set — This set includes a 2oz bottle of cleaner, an eraser and five ultra-fine markers in the following colors, red, black, green, blue, and purple. Assorted Chisel Tip, Set of 16 — This set includes two each of Black, Red, Blue, Green, Orange, Brown, and Purple as well as one each of Lime, and Teal. Assorted Ultra-Fine Tip, Set of 8 — This set of assorted colors includes red, pink, orange, purple, blue, green, brown, and black. ® Expo is a registered trademark.